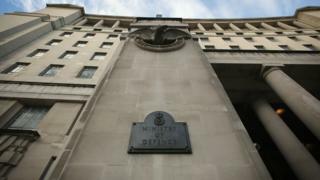 The Ministry of Defence has set up an operations room in a bunker at its main Whitehall building to deal with a potential no-deal Brexit. The preparations are being run under the banner of Operation Redfold - although officials stress they are part of wider cross-government planning. An MoD spokesman said it was "always willing to support wider government planning for any scenario". Defence chiefs had previously said 3,500 troops were being readied. BBC defence correspondent Jonathan Beale said the MoD was "stepping up a gear" with the new room "deep in the bowels" of its building. He said the room, which is already used for crisis management throughout the year, would be used to coordinate efforts in the event of a no-deal Brexit, although it was not yet clear what duties troops would undertake. A draft European Council document says the UK could be offered a Brexit delay to 22 May on the condition MPs approve the withdrawal deal the prime minister has agreed with EU leaders. But the government has been preparing for a potential no-deal in the event Theresa May's plans are rejected. It has published a series of guides - which cover everything from pet passports to the impact on electricity supplies. Defence minister Mark Lancaster announced in January that reserve military officers could be called up for a year of service as part of government plans for a no-deal Brexit. The defence spokesman said Operation Redfold was part of the continuation of the planning under the government's preparations, which are known as Operation Yellowhammer. He said: "We have committed to holding 3,500 troops at readiness to aid contingency plans. It comes as MPs were urged by the deputy speaker to take taxis home from Parliament and not travel alone in the coming days, over security fears ahead of potentially crunch Brexit votes next week. No-deal Brexit: Should NHS patients be worried?